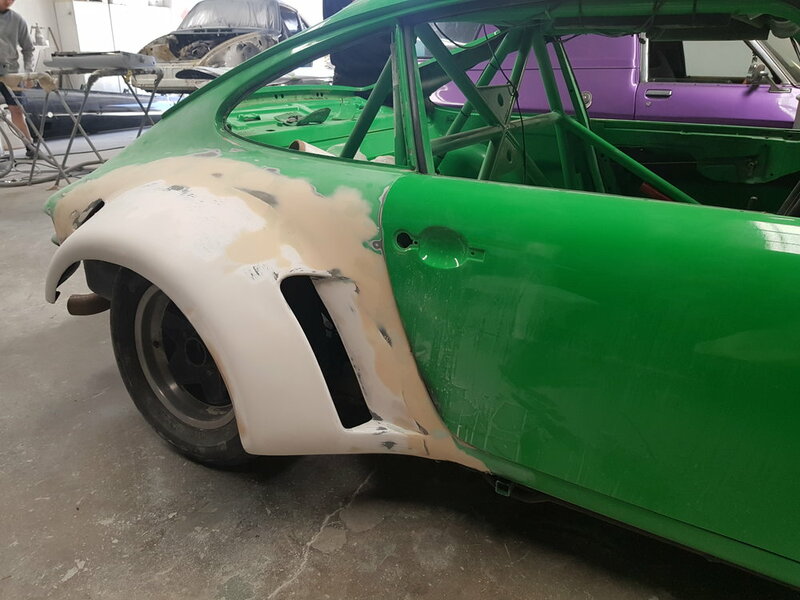 Our love for the classic RSR's of the early seventies inspired the building of our favourite car here at Ktec. 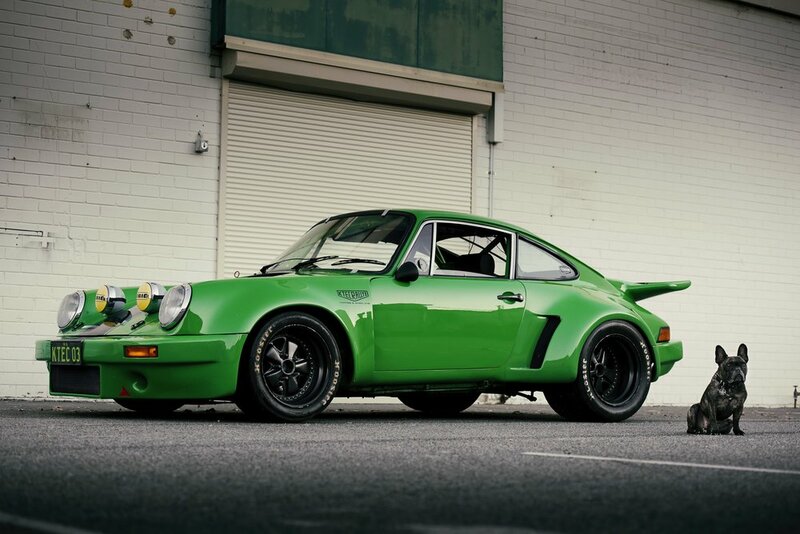 The Viper Green (mostly period correct ;) 74 RSR. BEAST! Don't be misled, make no mistake, this car gets driven hard, and is well used! The shop dog - ZED. STANCE! Following the random photo's captured by the guys during the build - watch this amazing car take shape over the 14 months of the build. The start of something VERY WIDE. Grafting the fibreglass fenders on. This was one of the most fun days ever. This 78' 911 was originally built as an IROC spec RS replica , to compete in the classic class of Australian tarmac rally. Brendan built this car first time around in 2007, it was painstakingly pieced together with plenty of love (being built for himself at the time), and to the letter of the rules. Elephant racing suspension (sway bars, tie rod ends , spring plates etc), Bilstein shocks valved to suit the massive torsion bars. Custom 17" Fuchs, with class restricted 225 front and 255 rear Semi-slicks . The motor was built from a 930 turbo case, with bigger cylinders & JE pistons to take the capacity to 3.5l, heads were port matched to the intake and exhaust to make the most of the centre lube RSR cams, and plenty of other mods. Sadly, it was let go due to un-foreseen circumstances. In 2015, the RS returned home! 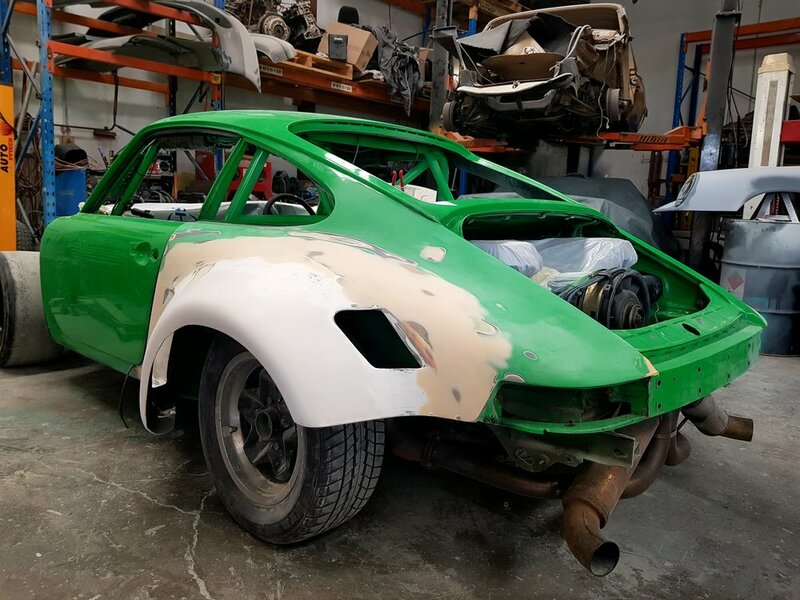 2017 saw her rebuilt into the current 74' RSR wide body. As well as the massive increase in track front and rear, and keeping with the car's new over the top personality, an even angrier motor was needed. The faithful 3.5 litre was carefully removed for future use in another project. A tired 964 3.6 was located as the base . Brendan pulled the motor down and worked his magic on the case before rebuilding with heaps of trick bits - JE pistons, PMO 50mm throttle bodies, straight cut (and noisey as hell) intermediate shaft gears, and a MoTec M48 keeping it all under control. So far we have run the RSR in the Adelaide Motor Festival of Sport , and most recently the Targa South West Tarmac rally. Placing a well earned third in the classic competition class. This 911 will remain with KTK for a long time, this time around. We will add to the colourful history as we race, show and enjoy this BEAST.